West Glacier is an unincorporated community and census-designated place (CDP) in eastern Flathead County, Montana, United States. 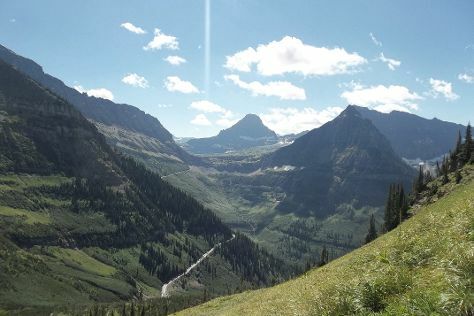 Get ready for a full day of sightseeing on the 1st (Tue): get to know the fascinating history of Garden Wall, then take in the dramatic scenery at Virginia Falls, and then cruise along Going-to-the-Sun Road. To see maps, reviews, other places to visit, and other tourist information, use the West Glacier trip builder . Boston to West Glacier is an approximately 10-hour flight. You can also drive; or take a train. Due to the time zone difference, you'll gain 2 hours traveling from Boston to West Glacier. In September, West Glacier is little chillier than Boston - with highs of 70°F and lows of 40°F. Finish your sightseeing early on the 2nd (Wed) so you can drive to Great Falls. Great Falls is a city in and the county seat of Cascade County, Montana, United States. On the 3rd (Thu), contemplate the long history of First Peoples Buffalo Jump State Park, then admire the masterpieces at C.M. Russell Museum, then pause for some serene contemplation at St. Ann Cathedral, and finally get to know the fascinating history of Lewis and Clark Interpretive Center. To find where to stay, other places to visit, more things to do, and tourist information, read our Great Falls day trip planner. You can drive from West Glacier to Great Falls in 3.5 hours. Another option is to do a combination of train and bus. In October, plan for daily highs up to 59°F, and evening lows to 35°F. Finish your sightseeing early on the 3rd (Thu) to allow enough time to travel to Dillon. Dillon is a city in and the county seat of Beaverhead County, Montana, United States. Kick off your visit on the 4th (Fri): get engrossed in the history at Dillon Visitor Center, then take your sightseeing to a higher altitude at Pioneer Mountain Wilderness Area, and then mingle with the ghosts of the past at Bannack State Park. To find ratings, photos, other places to visit, and other tourist information, use the Dillon route maker website . Traveling by car from Great Falls to Dillon takes 3.5 hours. Expect a daytime high around 59°F in October, and nighttime lows around 33°F. Wrap up your sightseeing on the 4th (Fri) early enough to travel to West Yellowstone. On the 5th (Sat), see what you can catch with a fishing tour, appreciate the extensive heritage of Yellowstone Historic Center, and then identify plant and animal life at Grizzly and Wolf Discovery Center. Plan my West Yellowstone trip by asking Inpirock to come up with tips and suggestions. Traveling by car from Dillon to West Yellowstone takes 2.5 hours. Expect slightly colder temperatures when traveling from Dillon in October; daily highs in West Yellowstone reach 50°F and lows reach 25°F. Wrap up your sightseeing on the 5th (Sat) to allow time to drive to Bozeman. Bozeman is a city in and the county seat of Gallatin County, Montana, United States, in the southwestern part of the state. Kick off your visit on the 6th (Sun): get a new perspective on nature at Museum of the Rockies, get a new perspective on things with Boat Tours & Water Sports, and then sample the fine beverages at Bozeman Spirits Distillery. Start your trip to Bozeman by creating a personalized itinerary on Inspirock. Traveling by car from West Yellowstone to Bozeman takes 2 hours. Alternatively, you can take a bus. Traveling from West Yellowstone in October, expect nights in Bozeman to be about the same, around 30°F, while days are a bit warmer, around 59°F. On the 7th (Mon), wrap the sightseeing up by early afternoon so you can travel back home.